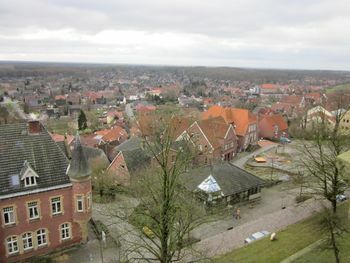 Bad Bentheim seen from Burg Bentheim. Bad Bentheim is a town in the state of Lower Saxony. It is a picturesque medieval town that sits on a hill close to the border with the Netherlands, and a popular regional destination due to its imposing castle and its sulphur springs. The county of Bentheim is known to exist since at least 1050. It was converted to Protestantism in 1544 by Count Arnold II of Bentheim-Steinfurt. In 1865, Bentheim gained town rights; one year later, it would be taken over by Prussia, and it belongs to Germany until nowadays. The word "Bad" was added to the town's name in 1979, as its status of spa town was recognized. Among the visitors of the sulphur springs were Otto van Bismark (which has a statue in Downtown), Kaiser Wilhelm I, Queen Emma of the Netherlands and her daughter Wilhelmina. Nowadays, Bad Bentheim is a popular local tourism destination of the Dutch-German border. A visitor can easily spend a day or a weekend there, visiting the castle and the downtown, walking in the forests, and relaxing at the thermal springs. Trains to Bad Bentheim depart from Hengelo (in the Netherlands) and from Osnabrück (in Germany). By car, the town can easily be accessed by Auto-bahns 30 and 31. Going by bicycle from nearby cities (like Enschede) is also perfectly possible. Bad Bentheim is small enough to be explored on foot. The distance between downtown and the mineral therme is about 2 km. Cycling around the town should be easy, but the town itself sits on a hill. Bad Bentheim has a charming Old Downtown with various shops, including some tourist-oriented shops selling souvenirs and handcrafts. There are no big department stores, however. This page was last edited on 22 February 2014, at 19:05.